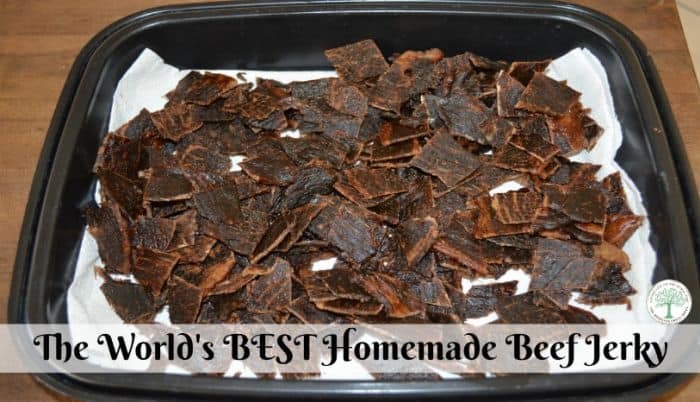 How to make the world’s best homemade beef jerky! When I was growing up, my father would spend literally hours making the world’s best beef jerky. He would choose the finest beef roast, marinate it in his special blend of seasonings, slice it paper thin, and stick it a warm oven for 24-36 hours. The beef jerky smell would waft all through the house, and we could barely wait to try it. As soon as the smell of the drying beef jerky began to drift from the oven, we would all sneak in there to sample and “check on it” for him. As a matter of fact, I don’t really remember there being any beef jerky to put away for later, as we would sample it all until it was gone. Finally, after I got married, he shared the secret of making beef jerky. 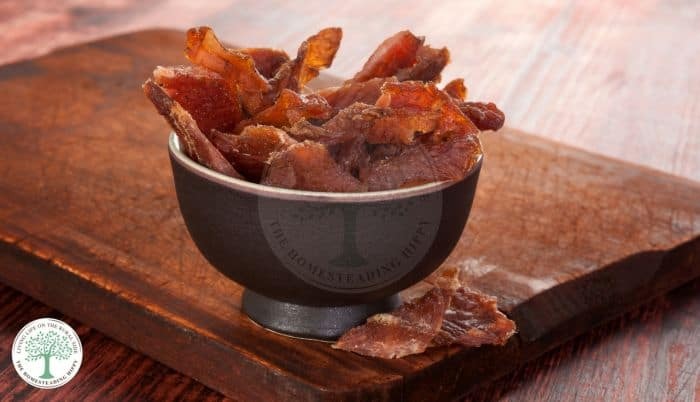 Out of all the beef jerky recipes I have tried, this one is my family’s favorite. Truly, the world’s best jerky recipe. One that beats store bought hands down. Now that I have a family of my own, I wanted to continue the tradition of simple, homemade, beef jerky. Mix the beef jerky marinade together, and add the roast, turning to coat. Remove roast, cut the meat very thinly and remove as much fat as possible. Return to the marinade for an additional 24 hours. Place the meat on dehydrator racks, and dehydrate at 155 for 12-24 hours. Set traps to keep family out of the jerky. Check on it several times, as you will notice there will be some missing after the kids go into the kitchen to “get a drink”. They will be testing “just a little bit” for you to check for doneness. Store in an airtight container, if you actually have any left. Place in a 200 degree oven for 6-8 hours, flipping over after 3 hours. I *THINK* that this will store for at least 3 months, but I have yet to have any last long enough to test that theory. Homemade beef jerky is great for snacking, camping, or hiking. It’s a great source of protein that will store on the pantry shelf. Of course, that assumes that you have any left over. 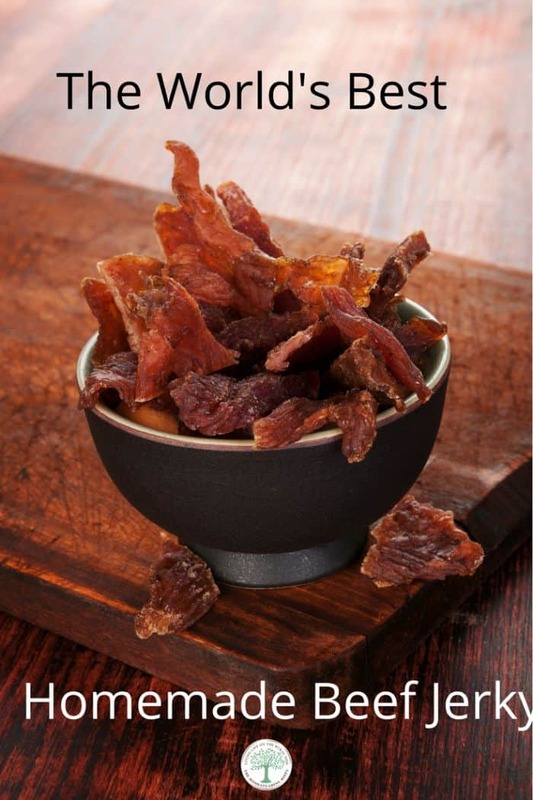 Have you made homemade beef jerky? Will you try this recipe? My guarded recipe is available for a slight fee. If you use less salt, it is a low sodium snack. Lower heat if possible is also an idea. Hahaha! Give me tips on traps to set! I couldn’t keep my boys out of it! Hey, Heather – just poking around your site. I want a dehydrator, but cannot find anyone I know that owns one to recommend one to me. Hi Kylee! I love having my dehydrator for so many things…it’s a worthwhile investment. How much beef jerky will 3 lbs of meat make? We bought our dream home a few years back and guess what??? The oven has a lot of unusual settings on it and one says “dehydrator” Awesome!